Atomic Weights of the Elements 1975 outlines the different problems that arise from the imprecise definition of atomic weight or relative atomic mass. This book reviews the natural isotopic composition of the elements and tabulates the relative atomic masses for selected radioisotopes. This book is comprised of one chapter. This text begins with an overview of the problems arising from the actual or potential variability of the atomic weights of several elements. This book then discusses the significance of having informative labels on chemicals that are commercially available. The reader is also introduced to the concept of a defined standard atomic weight. This book discusses as well the important changes in annotations and the wordings of footnotes to the Table. This book is a valuable resource for chemists, teachers, and students. 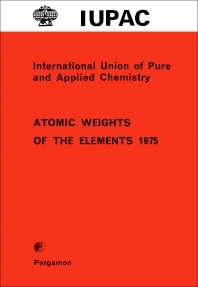 Research workers interested in atomic weights of the various elements will also find this book extremely useful.